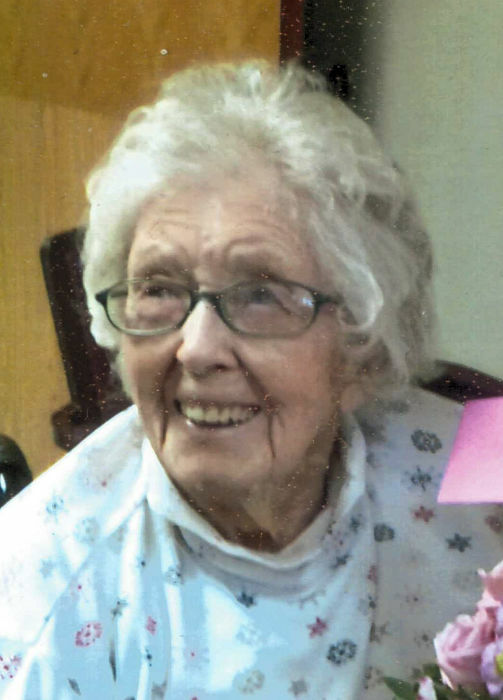 Genevieve I. Neff, 100, formerly of Meadville and a resident of the Crawford County Care Center, passed away there Sunday, October 14, 2018. She was born on October 23, 1917 in Bradleytown, a daughter of Glen and Sylvia Wright Collins. She married E. Clair Neff August 9, 1940 and he preceded her in death March 23, 1991. Genevieve was a 1934 graduate of Sunville High School, Venango County. She was a cook at the former Crawford County Home. A member of The First Assembly of God and former member of Trinity Lutheran Church, Genevieve enjoyed gardening. Survivors include two sons, Howard Neff (Carol) of Citra, FL and Kenton Neff (Sharon) of Snellville, GA; a daughter, Kay Bruce (Howard) of Hartsville, SC; five grandchildren; nine great-grandchildren; five great-great-grandchildren; and nieces and nephews. In addition to her parents, she was preceded in death by two sisters, Gladys Manning and Isobel Yates and a brother, Hazen Collins. Calling hours will be Thursday, October 18th from 11 a.m. to 1 p.m. at the ROBERT W. WAID FUNERAL HOME, 581 CHESTNUT ST., MEADVILLE where the funeral service will follow at 1:00 p.m. with Pastor Philip Torre of First Assembly of God, officiating. Memorials may be made to The First Assembly of God, 719 Washington St., Meadville, PA 16335.